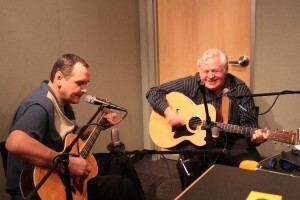 Joining us, Bill Weiner, who brings more than 45 years of experience as a Blues guitarist and historian, and Ron Jozwiak, fellow guitarist and friend. Here they perform a ‘sophisticated approach to early country blues,’ live on SLB. It was great to listen to Bill and Ron play together. Excellent show! I was hoping to hear “Cocaine Blues”! We will miss Bill Weiner so much. He was a gentleman on and offstage. We were lucky to have Bill perform at our gigs during our breaks at James Street Gastropub, among other places. He charmed audiences with his ragtime and old timey blues.